Version 7 retains all the classic ACID Pro features including real-time pitch/tempo transposition during playback and preview, unlimited tracks, and our signature pick/paint/play interface. ACID Pro 7 software also includes 90 virtual instruments so you can start creating music right out of the box. Experience unparalleled MIDI sequencing in ACID Pro 7 software, with real time MIDI processing and precise control over MIDI events. Use track envelopes to automate and modify modulation, expression, or other types of MIDI controller data. Expand your palette with native support for VST instruments and plug-ins. Create resonant sweeps, EQ changes, and add effects with parameter automation. ReWire and ASIO support help you smoothly integrate ACID Pro 7 software with your existing studio. ACID Pro 7 software has a dedicated mixing console for a flexible and efficient recording environment. Specify routing, assign audio effects, and use external effects processors with tracks and busses. ACID Pro 7 software also supports control surface automation and channel tracking for devices such as the Mackie Control and Frontier Design TranzPort. ACID Pro 7 software supports control surface automation and channel tracking for devices such as the Mackie Control and Frontier Design TranzPort. Its unique Beatmapper tool makes remixing easy, and the Chopper tool helps you create impressive drum fills, stutters, and DJ effects. Maximize efficiency with folder tracks and cluster editing to drag, pitch-shift, cut, copy, and paste whole sections of your arrangements. Use the Clip Pool to choose and arrange events in your compositions or create dramatic and subtle tempo changes with tempo curves. Projects can be delivered in nearly any format - all without leaving the ACID Pro 7 environment. 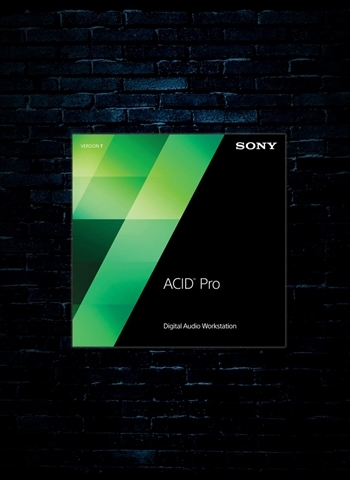 ACID Pro 7 includes software for professional music production and editing, including ACID Pro Effects Rack powered by iZotope.